The history of fly fishing clearly demonstrates that the foundations of the sport were laid down in the Old World, specifically in England. On the demanding chalkstreams of the English countryside fly fishing rose from the contemplative pastime of Walton to the dogmatic, scientific school of Halford. Along the way countless contributions were made by individual fly fishers, many whose names have been lost with the passage of time. It is quite clear that many of the discoveries were made by several individuals at different locations, sometimes almost simultaneously, and apparently some styles of fly fishing were discovered and then forgotten only to be 'rediscovered' at a later date. 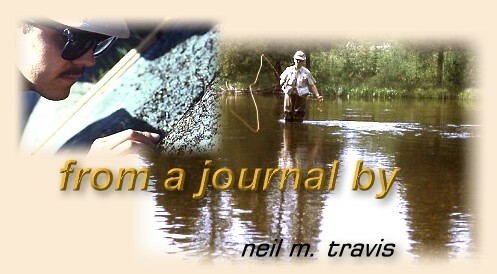 The history of fly fishing in the New World has a much shorter but no less convoluted history. The roots of fly fishing in the Americas appear to be found in the mountain streams of Pennsylvania. The colorful brook trout, not really a trout but a char, was the object of the fly fishers offerings during those formative days. Streams with names like the Sawkill, Lackawaxen, Bushkill, and Brodheads were the streams where American fly fishing had its earliest beginnings. In 1836 Arthur Henry built a structure called the Halfway House along the Brodheads, a primitive log framed inn constructed to meet the needs of mule skinners and stagecoach passengers traveling along the freight wagon road. In 1848 it was enlarged and renamed the Henryville House, which was to become the oldest fly fishing hotel in America. George Washington Bethune, the editor of the first American edition of Walton's The Compleat Angler, published in 1847, was the first writer to pay homage to the Henryville House, but the most famous early fly fisher to visit the house was Thaddeus Norris. Thaddeus Norris published The American Angler's Book in 1864, and it covered fishing in America from warm water fishing for bass to the wilderness salmon fisheries of the north country. Norris experimented with primitive dry flies, and he described the technique in detail in his book. These flies were traditional wet flies that were dropped gently on the surface of the water and taken by the trout before they could sink. This was some 25 years before similar tactics were used by Theodore Gordon on the Catskill streams in New York. Perhaps the most important contribution that Norris made to American fly fishing, and fly fishing in general, was his collaboration with Samuel Phillippe, a gunsmith and violin maker. Phillippe invented the four and six-strip method of constructing the modern bamboo fly rod. Although English rod makers had long experimented with three-strip bamboo rods they glued the surface fibers on the inside, but Phillippe placed the surface or power fibers on the outside. The rods, made from Calcutta cane around 1845, were hexagonal and then turned round. Phillippe passed his knowledge on to Norris who became one of the great rodmakers of the nineteenth century. By 1888 the brook trout fishing on the Pennsylvania streams was in sharp decline. The uncontrolled lumbering and clearing of the land for agriculture changed forever the streams that had once been the stronghold of the eastern brook trout fishery. The last large brook trout recorded in the registry at Henryville House was a two-pounder taken in 1893. 1895 marked the founding of the Brooklyn Flyfishers, and the event was recorded in the registry at Henryville, but after a disappointing season in 1897 they abandoned the Pennsylvania brook trout waters for the Catskill streams in southern New York. Here they established themselves near the Little Beaverkill where the most famous American angler, Theodore Gordon, was already plying the waters with his first primitive dry flies. A series of ridges lying west of the Hudson river give rise to all of the famous Catskill streams, and the principal Catskill rivers have their source on two mountains; Doubletop and Slide. Doubletop Mountain is the source of three historical rivers; Dry Brook, Willowemoc, and the legendary Beaverkill. Slide Mountain, the more impressive of the two mountains, is the headwaters of the Esopus, the Rondout, and both branches of the Neversink, the home waters of Theodore Gordon and Edward Ringwood Hewitt.